Feel like playing with your iPad and getting creative in Photoshop? You’re in luck! Adobe has announced a free update to Photoshop CS5 that includes the Photoshop Touch Software Development Kit (SDK), a new scripting engine that lets developers create tablet applications that interact with Photoshop. The first three applications were written for the iPad by Adobe to showcase the mind-boggling capabilities of this new technology (though development is possible for other devices including Android and Blackberry PlayBook). They include an application for mixing colors and creating custom color schemes, finger-painting, and for controlling frequently used Photoshop tools and sharing in-progress documents. If you’ve got Photoshop CS5, an iPad, and a wireless network, prepare to be amazed. If you’ve ever mixed paints in the real world to create your own colors, you’ll enjoy Color Lava ($2.99), a color-mixing and color scheme creator. The mixing interface is simple, beautiful, and user friendly. At the upper left is a well filled with water that you can use to clean your finger/brush (when you touch it the water actually ripples and the paint color bleeds into it). Below the water well are circular color wells, a mixing area in the middle, and five empty (white) color swatches on the right. You can start from scratch or begin with a photo that lives in your iPad’s Photo library, which is handy for snatching colors from a photo in order to produce a color scheme. Just tap a color well, or a color in your photo, and swirl your finger around in the mixing area to create a dab of paint. When you do, that color appears as your first color swatch at the upper right of the interface. To add another color, click that well and swirl it onto your dab—the swatch changes automatically as you mix colors. Use the grayscale color wells to add white or black to produce a tint or shade. When you’re ready to produce another color swatch for your scheme, click a white swatch on the right and repeat the process. You can also customize the paint colors by double-clicking a color well and then using sliders to change hue, saturation, and brightness. Once you’ve created five swatches, you can send them to Photoshop’s Swatch panel. You can also email your paint dab plus the color scheme—along with their RGB and HSV values—to your client or art director. Once you’ve created five swatches, you can send them to Photoshop’s Swatch panel or email the color scheme with its HSV and RGB values to a client or colleague. Remember what it was like to finger-paint or draw with chalk as a child? Back then there was nothing between you and your creation: no hardware, no stylus, nothing at all. That’s exactly the experience you get with Adobe Eazel ($5), the new painting app, though you don’t have to wash your hands afterward. This incredibly fun application lets you finger paint, without any menus or toolbars, on every free pixel of the iPad’s touch-screen. When you place all five fingers on the touch screen, an extremely clever and forward-thinking interface appears beneath your fingers in the form of graphical icons. These icons let you change paint color, brush size, opacity, undo/redo one action (too bad it won’t undo more than one action), or close the painting. For example, to change brush size, place all five fingers on the iPad and then locate the size icon—it lives under your middle finger. Lift your other fingers and then drag your middle finger upward to increase brush size, or down to decrease size. The icons follow your fingers as they move. However, if that’s a little too disorienting, you can place five fingers down and then lift to summon a static interface in the middle of the iPad screen. While the new interface feels awkward at first, it’s akin to playing an instrument like a piano. Within an hour or two of dabbling, the five-fingered gesturing starts to feel intuitive, though it does take some serious experimentation to grasp how the controls work together in order to produce the brush strokes you want. For example, paint is wet when first applied—it dries in a few seconds—so crossing it with another stroke causes blending. Also, the larger your brush size, the more blending you get, just as if you were using water colors. Once you’ve finished your masterpiece, you can send it to Photoshop where it appears on its very own layer, complete with transparency. The art is enlarged to four times its original size during the transmission, too, producing an image that’s 2048 x 1536 pixels (9 MB). You can also save paintings into the iPad’s Photo app in JPEG format. Unfortunately there’s no way to open a saved painting in Eazel and continue to work on it. Hopefully we’ll see that in a future version. With a little experimentation, you can create silly or serious paintings with Adobe Eazel that you can then fine-tune in Photoshop. More of a productivity app than a creative tool, Adobe Nav ($2) lets you control Photoshop tools from your tablet, change your document’s zoom percentage, change Photoshop’s screen modes, and even change the foreground and background colors. If you frequently work with a slew of open Photoshop documents, Nav can display up to 200 of them as large thumbnails, providing a handy way to scroll through them in order to switch from one to another—something you can’t do in Photoshop. To activate another open Photoshop document, simply touch its thumbnail in Nav. Since Nav is in constant communication with Photoshop, closing a document in Nav also closes it in Photoshop (and vice-versa). You can also create new documents from within Nav. If you’ve got a wireless network, you can use Nav to show Photoshop documents in progress to coworkers or clients. For example, instead of summoning your art director to your computer to see the image (or transferring it via email), you can simply walk your iPad down the hall into their office or into a conference room for discussion and collaboration. 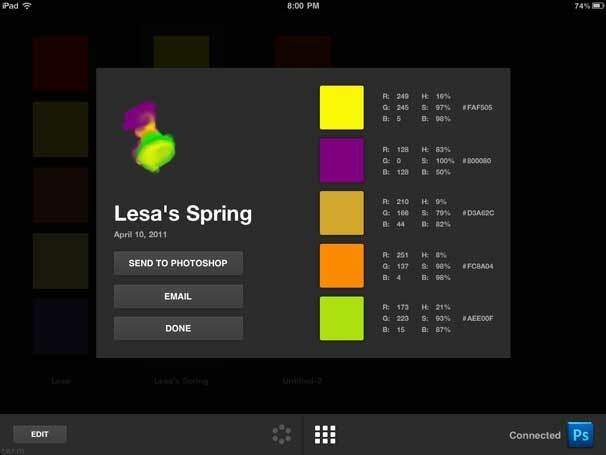 Nav lets you control Photoshop tools from your iPad. What a glorious time to be digitally creative! The iPad’s touch-screen integration with Photoshop makes the experience both fun and realistic. And by having nothing between you and your artwork, you can focus on creating in the purest sense. I have no doubt developers will be burning the midnight oil to push the envelope of this new technology and create other useful Photoshop-integrated apps. I can’t wait to see where they take us.